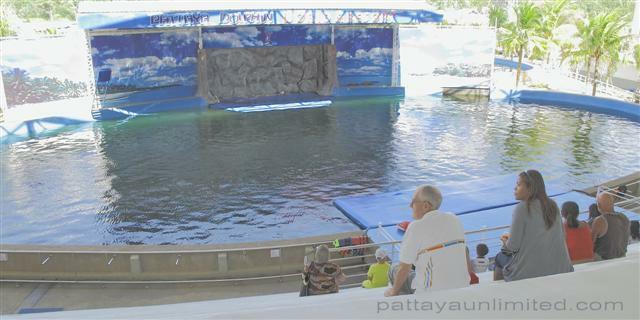 Thinking of visiting the Pattaya Dolphin Show, here’s a selection of photos and video (see below) from the show at the Dolphin World Resort which opened in August 2011. 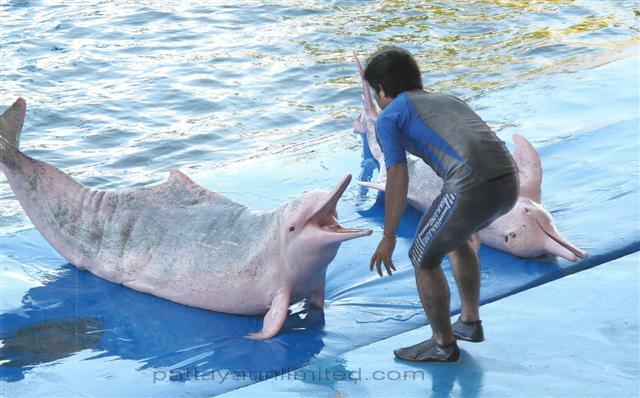 For Pattaya Dolphin World discount entry tickets, just scroll down the page for more information. For directions to Pattaya Dolphin World just click on the “location link” at the bottom of this post. The Dolphinarium at Pattaya Dolphin World Resort. The dolphinarium at Pattaya Dolphin World has tiered concrete seating, is roofed, sheltered from the sun and cooled by fans. Commentary during the show is in both Thai and English. I think this was the tail end of the Dolphin Show. The dolphin show lasts about 1 hour, food and drink is available on site. The Pattaya Dolphin World brochure claims many more activities are on site, including BB gun, Airsoft gun, Children’s playground, Fishing park and water park. Like the rest of us, dolphins have to jump through hoops now and then. Theadmission/entry fee at the Pattaya Dolphin Show was 500 Baht for foreigners, 199 Baht for Thais, 100 Baht for children. Foreigners with a Thai driving license get in for the same price as Thais. 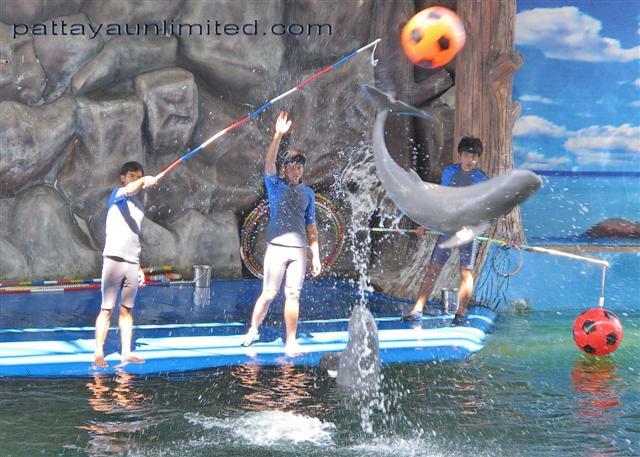 Get discounted entry/admission tickets to Dolphin World in Pattaya. Read this Pattaya online tour and entry ticket booking guide and get cheap entry tickets to all the best attractions, activities, shows, and sightseeing tours in Pattaya. Is Pattaya Dolphin World worth visiting? Is it one the best rated tourist attractions in Pattaya. 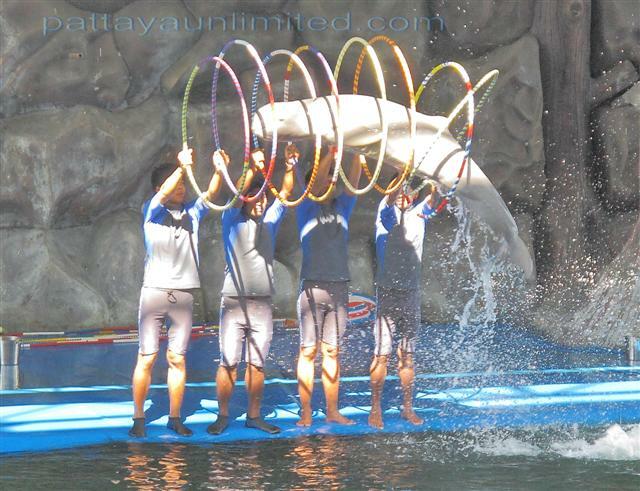 Here’s a “heads up” on some of the tricks performed at Pattaya Dolphin World. The show itself was quite entertaining, it’s just a shame about the double pricing, most of the Pattaya tourist attractions adopt the double pricing policy for tourists, but sometimes double isn’t double, it’s just a higher rate. At Pattaya Dolphin World Resort the rate is actually more than double, that’s a lot of money for a family to spend on 1 hours entertainment. Dolphins at Pattaya Dolphin World Resort. Many dolphin shows and dolphinariums claim that the dolphins used in their show are rescued dolphins, usually after the dolphin supposedly collided with a boat or becoming entangled in fishing nets. 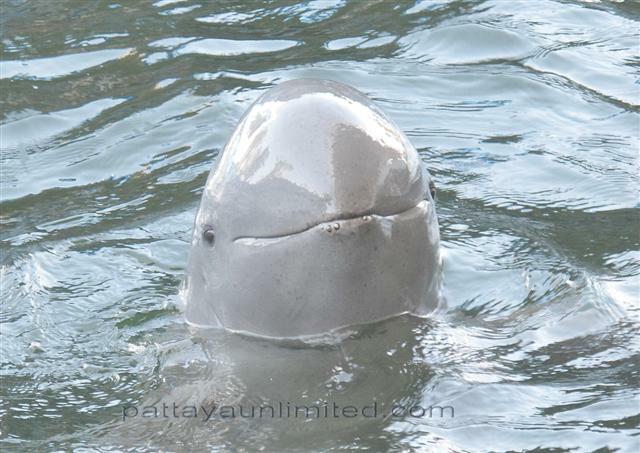 Irrawaddy dolphin at Pattaya Dolphin World, is he smiling ??. Animal shows, for better or for worse are becoming a popular sideline at many of the Pattaya tourist attractions, at Nong Nooch they feature an elephant show, the Tiger Zoo has a tiger show, the Crocodile Farm has a crocodile show, the Sanctuary of Truth also occasionally has a dolphin show. It is said that the dolphin which played the role of “Flipper” in the popular 1970’s T.V. series actually committed suicide because it became so depressed by life in captivity. Update June 28th 2018: Pattaya Dolphin World has received many reviews on Trip Advisor, quite mixed but many are negative. If I was you I would read the Dolphin World reviews on TripAdvisor.com before going. Many of the promised extra attractions are open, including shooting, quad bike riding, pony rides, and children’s play area. Reports on TripAdvisor.com suggest these extra activities are not included in the entry fee, so all in all it could be a rather expensive day out. You can find Pattaya Dolphin World and many more of Pattaya’s top tourist attractions on the Pattaya Tourist attractions Map.